An archeological mystery of Costa Rica is the large stone balls that were created from 200 BC to 800 AD. They range in size up to 2 meters and can weigh 16 tons (15,000 kg.). If you remember the opening scene of the first Indiana Jones movie, you might remember Harrison Ford running away from one of these balls rolling towards him in the jungle. There are at least 300 of these balls that are known, including several in the National Museum in San Jose, and two are on display in the United States, one at the National Geographic Society in Washington and another at the Peabody Museum at Harvard University. The stones came to public attention in the 1940's after United Fruit Company uncovered a bunch of them in their agricultural activities. They were made from a very hard stone, called granodiorite. Amazingly, they were transported from the quarry location to places as far as 50 miles away. This stone is in front of some shops on the circle in the middle of Tamarindo. The stones have been scattered around the country, with some rich people using them for lawn ornaments. There is another in Tamarindo near the beachfront restaurant at the Tamarindo Diria Resort. Before I noticed them right in town, the only one I had seen is at the entrance to the International Airport in Liberia. Today is Sunday, so we have new photos posted on our Viva la Voyage travel photo site. This week we are posting photos from Tanzania, Africa. This sign on a restaurant in Tamarindo announces that they will prepare meals from the fish that people catch. Deep sea fishing is a popular activity in Tamarindo, and this restaurant is on "the circle" at the end of the beach front street near where the fishing boats are located. If I went fishing a caught fish, I would definitely give my fish to this restaurant. I can't think of anything I would least like to do than clean a fish and prepare it for cooking. Of course, for those visitors who stay in hotels rather than condos, they must take their catch to a restaurant because they have no kitchen in which to cook. This week we have photos of the colors of Cape Breton, Nova Scotia, posted on our Viva la Voyage travel photo site. Tamarindo is a beach town, so what type of footwear would you expect to see for sale? This shop reminds me of Henry Ford's famous comment about his Model T: "You can have any color you want as long as it's black." When it comes to footwear, you can have any color you want, and any style you want, as long as it is a flip-flop or thong. This is a typical Tamarindo street scene. More surfers than traffic. This photo is a companion to yesterday's photo because together they show the two major intersections in town. In the background of this photo is the intersection where off to the right the road heads towards Langosta, and to the left the street continues up past a few small hotels and restaurants. 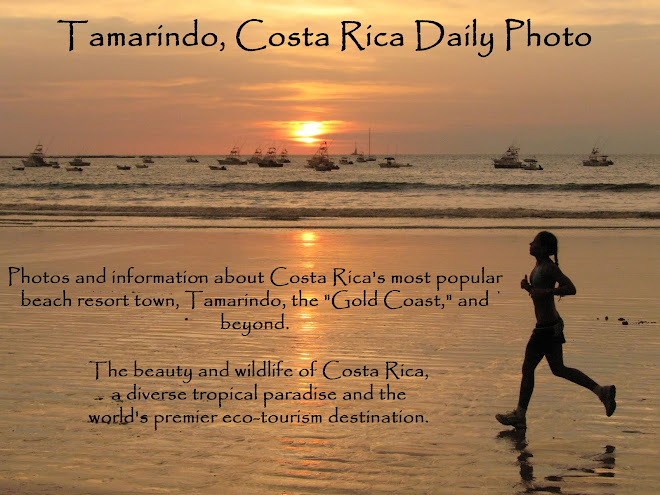 Even though Tamarindo is Costa Rica's leading beach town, as described by Forbes Magazine, it is still a small town, as yesterday's and today's photos of the two main intersections in town show. There are no traffic lights. In fact, there are not even any four way intersections where all traffic must stop. It appears that this woman is arriving in town, as she is pulling a suitcase, but the scene did not quite make sense to me. She is wearing a swim suit top, which is common for a beach town like Tamarindo, although I don't think people would normally wear swimsuits while traveling with suitcases. Most tourists do not arrive in town with dogs, butost local people would not be pulling a suitcase. Believe it or not, this photo was taken at one of the two major intersections in town. She is walking up the main street leading away from the beach. The street in the background is the beach front road, and the beach is just on the other side of the shops in the background. Yesterday I showed the surfboard sign that you see in this photo. Here is a photo of the rest of the restaurant. I took this photo early in the morning, before people would arrive for lunch. 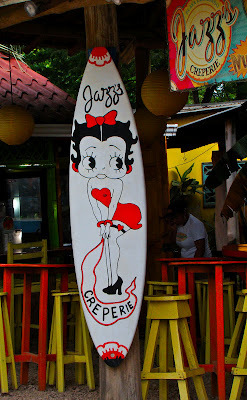 I guess that there is not enough demand for just a creperie in a small Costa Rican beach town like Tamarindo, so the menu is more diverse and includes sandwiches, churros and cafe food. I yesterday finished a series of photos on a walk along Langosta Beach, so today I thought I would begin a series of some photos of what you might see in a walk through Tamarindo town. You are invited to join me. Tamarindo is a beach town. There are a lot of shops and restaurants that cater to people on vacation, primarily Americans, Canadians, and Europeans. There are restaurants that offer gourmet dining, and there are places that offer what I would refer to as beach food. This is s a sign for a Jazz's Creperie. 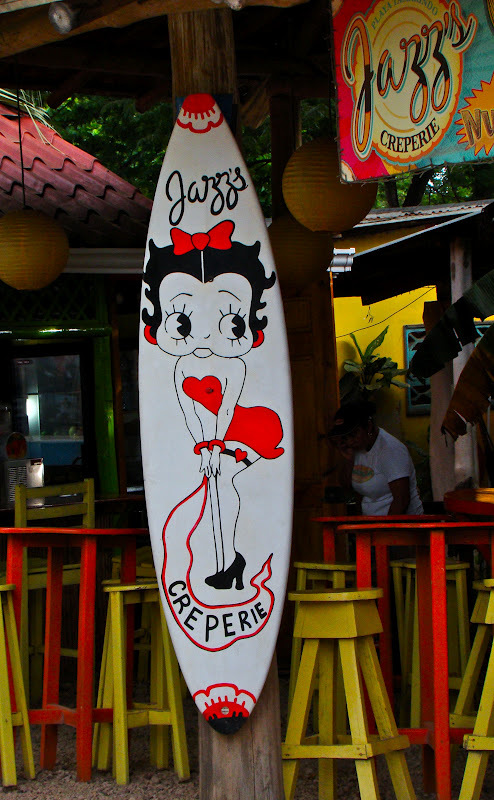 I guess it is a reflection of a beach town that a sign for a creperie would be painted on a surfboard, featuring what appears to be Betty Boop. How French. This week we have photos showing some of the colors of Cape Breton, Nova Scotia, posted on our Viva la Voyage travel photo site. I today conclude my photos of my little walk on Langosta beach on a July morning. I have more photos that I could use, but 6 weeks of photos from one walk is probably enough. I wanted to give m readers a feel for what a typical morning is like. Jack from Hartford Daily Photo commented a couple of days ago that there do not appear to be many people in these beach photos. Yes, that is correct, and that is part of the attraction of Playa Langosta. It is a quiet, residential area. There are never crowds on the beach. Even nearby Tamarindo Beach is not crowded in comparison to beaches in the USA. I conclude this series the way I began it, with a photo of Langosta Beach taken from the level of the beach. This part of the beach is underwater during high and medium tide. The point of land in the distance is Cabo Velas, which is across the other side of Tamarindo Bay. Today is Sunday, so we have new photos posted on our Viva la Voyage travel photo site. This week we are showing some photos of the colors of Cape Breton Island, Nova Scotia. Here is another photo of the young girl that I showed yesterday. She is indeed running towards the ocean waves. I did that when I was a child. The surf seems to have a magnetic draw for children. We are showing photos of the jungle Khmer temples of Siem Reap, Cambodia, on our Viva la Voyage travel photo site. The appeal of the beach and ocean is universal, and the exuberance of this young girl running towards the waves is understandable. This is yet another in the series of photos that I have been showing of my walk along Langosta beach. This family was exploring the tide pools. I am sure that the young girls explored with delight the wonder of the little sea creatures that live among the tide pools. This is another photo of the clouds on the same morning as yesterday's photo. I stepped back behind the the trees that line the beach behind the mouth of the Langosta Estuary, with the estuary providing a reflection of part of the sky. This photo illustrates the benefits of layering in photographic composition. There are five layers in this photo -- the foreground trees, the estuary sand, the reflections in the water of the estuary, the beach sand, and the sky. I find this composition much more interesting than yesterday's photo. It adds depth and draws the eye into the photo. Here is another beach and sky photo from the same July morning walk along Langosta beach that I hae been showing during this past month. This large cloud out to sea foreshadows that the sunny morning will probably see a brief shower in the afternoon, which is typical for the weather in May - August. Clouds like this do not occur during December - April, which is our hot, dry season. Local people call it summer, even thought we are in the northern hemisphere, because it is warmer than the actual summer months due to the dryer weather. This is a closer view of the mossy area that I showed yesterday in some of the tide pool areas of Langosta beach. Like the overhanging estuary trees I showed a few days ago, this is another example of life in the transitional areas between land and sea. I mentioned in yesterday's photo that I took my walk at low tide. 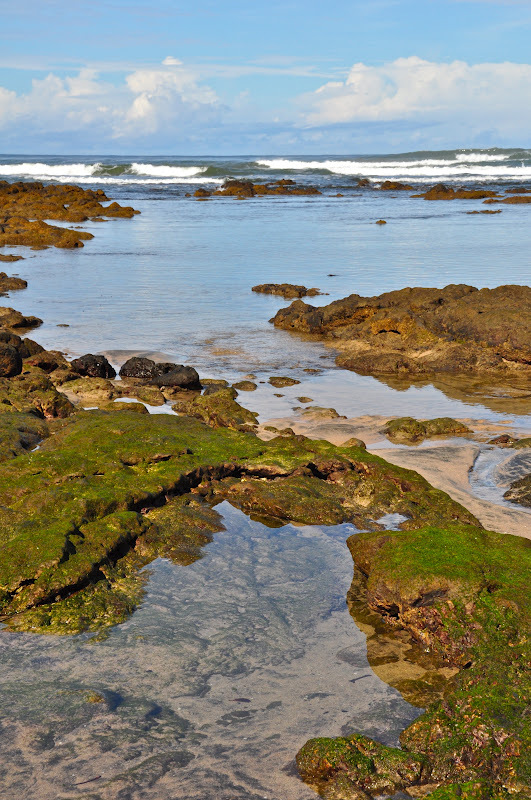 Here is a view of some of the tide pools extending out to the ocean. This is a good area to explore the life of the tide pools, but there are spots where care is needed not to slip on the moss covering some rocks. Today is Sunday, so we have new photos posted on our Viva la Voyage travel photo site. This week we are showing some more photos of the amazing Khmer jungle temples around Siem Reap, Cambodia. Here is more of the area near where the Langosta Estuary flows out to the sea. When I took my morning walk on the day when I took these photos, it was low tide. As the tide comes in, the water flows over this sandy area and under the overhanging trees. The revers happens as the tide flows out. The trees have adapted to hang over the water, leaving this transitional area where the roots do not take hold. This week we have photos highlighting the wildlife of Tanzania, Africa posted on our Viva la Voyage travel photo site. This photo explains he odd patterns in the sand that I showed yesterday. Little crabs come out of their holes in the sand and deposit little balls of sand that they have dug out of their burrows. There must be quite a network of tunnels under the sand. I wonder why they do not flood with water when the tide comes in and covers over this area, but the crabs are obviously doing fine. This is a patch of sand. It is rather strange. We'll see if you can guess what would cause sand to look like this. As usual when I do something like this, the answer will be shown tomorrow. Today is my wife's birthday. Please stop by Julie's Scottsdale Daily Photo site to leave a comment with a birthday greeting. I don't know why, but the sandy area around Langosta Beach and Langosta estuary has areas where there are lots of shells, and other areas where there is sand, and only a few shells. This vein of shells and coral was in the shallows of near the mouth of the estuary. The crabs must be adapted to the variable salt content of water, as the tide brings salt water in, but the estuary would also allow fresh water to flow out to the sea. Wading in the estuary near the shore revealed this pattern of shadows in the shallow water from the mangrove trees that line the estuary shore. My walk along the beach included a short detour up into the Langosta estuary, but this is as far as I could walk. The end of the sandy beach and the beginning of a mangrove thicket through which it is impossible to walk. This week we are featuring photos of the wildlife of Africa on our Viva la Voyage travel photo site. think you will like them. 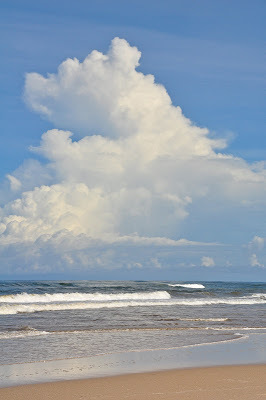 This photo combines three of my favorite elements: clouds, the ocean, and a low angle perspective of the beach. This is yet another photo that I took on the walk on the beach on the same July morning on which I took the photos that I have been showing during the past few weeks. EARTHQUAKE NEWS UPDATE: Wednesday's 7.6 earthquake was the second strongest in Costa Rican history. It lasted for an amazingly long 45 seconds, and there have been more than 500 aftershocks. Officially, there were no casualties. The woman who died of a heart attack was not counted as an earthquake fatality. A 7.6 quake in other areas of the world have at times caused thousands of deaths. Costa Rica has seismic standards in its building codes. Only 190 homes were destroyed, and no one was killed from falling debris. It helped that the epicenter of the earthquake was about 25 miles (40 km) deep under the earth's surface. Today is Sunday, so we have new photos posted on our Viva la Voyage travel photo site. This week we are showing photos highlighted by the wildlife of Tanzania, Africa. I think you will like them. I assume that these surfers are wearing water shirts, not wet suits, to protect from sun burn, not for warmth. Unlike California, the Pacific in Costa Rica is warm and ideal for swimming all year around. How do you like their colorful swim trunks? Apparel designers must have a code written somewhere that says that they can use bold, bright colors when designing men's clothes for the beach or the golf course. The dog that I showed the day before yesterday's interruption of this series for earthquake news became curious about small items in the sand, if they moved. This crab was moving, slowly, but fast enough for the dog to notice. Like me, this crab seemed to be out on a morning walk on the beach, except he had to carry his house with him. Costa Rica experienced a major earthquake yesterday, very close to Tamarindo! I am interrupting my current series of beach photos to bring news of the earthquake. A 7.6 magnitude earthquake struck the Nicoya Peninsula in Costa Rica's northwest province of Guanacaste. That is where Tamarindo is located. The epicenter was only about 25 miles (40 km) south of Tamarindo. Most important, there apparently was only one reported casualty. Sadly, a woman in her 50's in Filadelphia died of a heart attack during the earthquake. Filadelphia is twice as far from the epicenter as Tamarindo. I am at our home in Scottsdale right now, rather than at one of our condos in Tamarindo. Reports from our property management company are that both of our condos are just fine, without structural damage to the buildings and without even broken water lines. Roof tiles were shaken off the buildings and glasses and dishes fell out of the cabinets and shelves. We watched out condo building as it was being constructed. The walls and floors are solid concrete, with lots of rebar. Even many of the interior walls are concrete. Thank goodness the construction was so strong that the buildings would survive a major quake so close. The earthquake was felt throughout Costa Rica, and also in Nicaragua and Panama. Most of the news reports reaching the international media come from the capitol of San Jose, which is 90 miles (144 km) away from the epicenter. The reports were that the quake was frightening because it lasted a long time, but there were not aftershocks. There are interruptions to some electricity and other services. Costa Rica does not have a military, so it lacks the emergency response capabilities that are often provided by a military. The people are resourceful, and reports were that people stayed calm and are helping each other. I am using a photo of a mosaic in the Tamarindo Catholic church to illustrate this post about the earthquake. I will resume the beach series tomorrow. I addition to running and chasing waves, the dog was stimulated by tracking items that sparked his curiosity on the beach. Tomorrow I will show you an example of the creatures that drew the interest of the dog. The dog that I showed yesterday enjoyed running on the beach even when he was not chasing the waves with his family. In this photo, he is pivoting and high speed, kicking up and leaving track marks in the sand. Tomorrow and the next day I will show what happens next. The father, son and dog I showed yesterday were clearly enjoying their time at the beach. Here is a classic scene of the family chasing the waves. I like the way that the young father is communicating the exuberance of the occasion so that his toddler knows that this is a time for excitement and joy. My guess is that after the morning on the beach, the child will be ready for a nice, long nap. Maybe the father, also. I showed a photo of this dog the other day, and here is the father and son to whom the dog belonged. They look like they are enjoying their morning on the beach, especially the dog. Today is Sunday, so we have new photos posted on our Viva la Voyage travel photo site. This week we have posted some additional photos from Julie's rafting trip through the Grand Canyon. Today's worldwide Daily Photo Theme Day is "People Watching." This is the most unusual people watching photo that I have. No, I did not pose this woman. No, she was not posing for me. She was posing for a man who was taking photos. I took this photo with a strong telephoto lens from a long distance, and then I cropped the photo so that the man was outside the frame. I do not know if she was a model or why he was taking photos. It was sufficient for me to be able to "poach" on the scene and take a photo as well, watching from far away. The golden glow of the sunset on the water and the sun backlighting the flowing gown provided a special touch for the photo.